Serial Scoop: Lifetime Movie 'Showing Roots' Premieres Tonight, Stars Maggie Grace, Uzo Aduba, Elizabeth McGovern, Adam Brody, Cicely Tyson. Lifetime Movie 'Showing Roots' Premieres Tonight, Stars Maggie Grace, Uzo Aduba, Elizabeth McGovern, Adam Brody, Cicely Tyson. Lifetime movie Showing Rootings premieres Thursday, May 26 at 10 p.m. ET/PT. 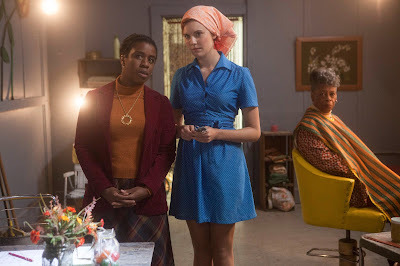 Set in 1977, Showing Roots explores the pent up racial tensions of a small town through the eyes of two women (Maggie Grace, Taken and Uzo Aduba, Orange is the New Black), who work together at the local beauty parlor. They forge an unlikely friendship and become inspired to integrate their town when the miniseries Roots hits the airwaves – much to the dismay of those around them. The cast of Showing Roots includes Elizabeth McGovern (Downton Abbey), Adam Brody (The O.C.) and Cicely Tyson (The Trip to Bountiful), who starred in the original Roots. The movie is directed by Michael Wilson and written and produced by Susan Batten. Soap favorite Kassie DePaiva is a co-producer on the movie.